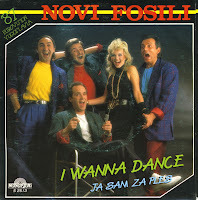 Novi Fosili (English: The new fossils) was a Croatian pop band, one of the most popular music acts in former Yugoslavia. They formed in Zagreb in 1969. They found success when composer Rajko Dujmić joined the band in 1976. That same year the band played at the Split Festival, where their song 'Diridonda' became a hit throughout the country. Their next several albums sold millions of copies and delivered many hits that are still aired on radios in Croatia today. The first female singer was Đurđica Barlović, in 1984 replaced by Sanja Doležal. The group's male vocalists were Vladimir Kočiš Zec and Rajko Dujmić. In 1987 the band represented Yugoslavia at the Eurovision Song Contest. With their song 'Ja sam za ples' they reached fourth place. The single was released all over Europe, but this didn't bring them international success. The band disbanded when the former Yugoslavia fell apart.